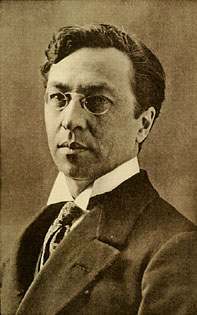 Wassily Wassilyevich Kandinsky was born on December 4, 1866 in Moscow, Russia. His parents were upper middle class, and taught him how to play the cello and piano, being accomplished musicians themselves. He spent most of his childhood in Odessa. 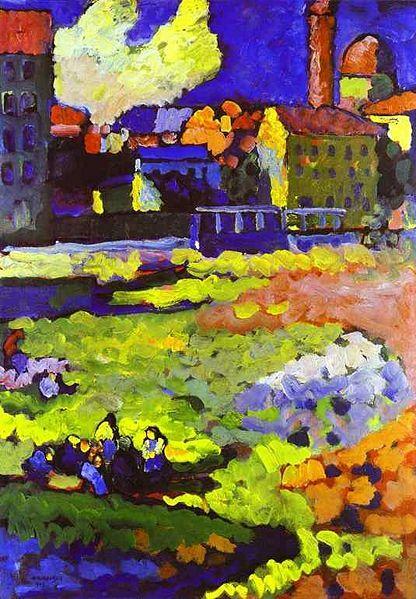 Kandinsky enrolled at the University of Moscow at the wish of his father, and chose to study law and economics. After passing his exams six years later, he was offered a professorship at Derpt University in Tartu, Russia, and began teaching. During his professorship, as a religious man, he wrote a book on spirituality called Concerning the Spiritual Art. In 1892, he married his cousin, Anna Chimyakina. In 1895, the year before he turned 30, he attended an impressionist exhibit. On display were works by Manet, Degas, and Renoir, but the piece that inspired him the most was Monet’s Haystacks at Giverny. He hated the out-of-focus aspect of the piece, and how the haystack hardly seemed there. “It was from a catalog I learned that this was a haystack. I was so upset for not recognizing it. I also thought that the painter had no right to paint in such fashion.” The next year, he quit teaching, traveled to Munich, and attended the private art school of Anton Azbe. Kandinsky was dissatisfied by the teachings and left. He went on to study art at the Academy of Fine Arts in Munich, and returned to Moscow after World War I had started in 1914. Some of Wassily’s early pieces are similar to Impressionism, and other are like the Fauves. In 1903, he painted Der Blaue Riter, which is shown in the blurry perspective, similar to Impressionist painting. A rider on his horse can be seen fleeing across a meadow. 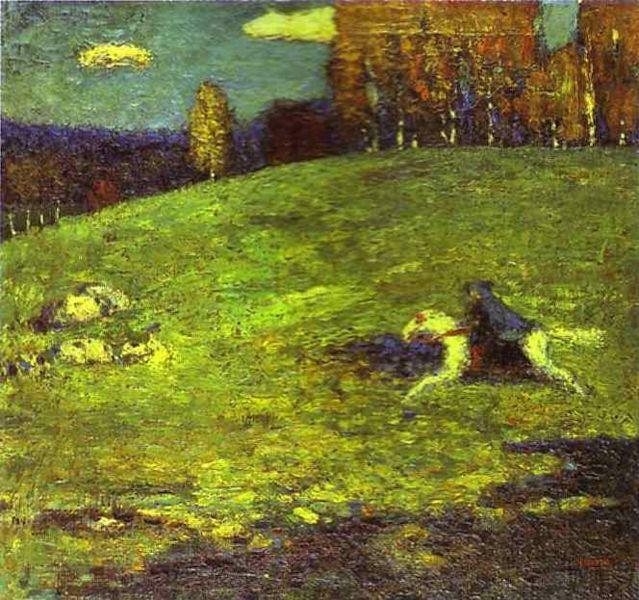 In a blue cloak, and because of the fuzzy quality, it appears as if there are two riders on the horse. This painting was later to become a big influence in his life. Kandinsky also divorced his wife the same year. He had been having an affair with an art student, Gabrielle Munter since 1902. He said he could no longer lie to Anna about it. In 1911, Kandinsky along with artist Franz Marc started Der Blaue Riter, a movement specifically aimed at the promotion of abstract art. The group was named after Wassily’s painting, it was considered as an influential piece. It was seen as what art could possibly look like in the future. It ended in 1914, but many great pieces of art came out of that movement. His most famous painting, Composition IV was painted in 1914, it represented the art of the future. From a a persons point of view, the painting looks like random streaks of colors and lines, but they all have a story to tell. The red “spots” in the front and the thick, black lines are actually three Cossacks preparing for battle. On the left is an ensuing war, on the right is peace. His overall goal for this work was to depict an apocalyptic battle that will end in eternal peace. It may be a painting, but it is also a musical composition. 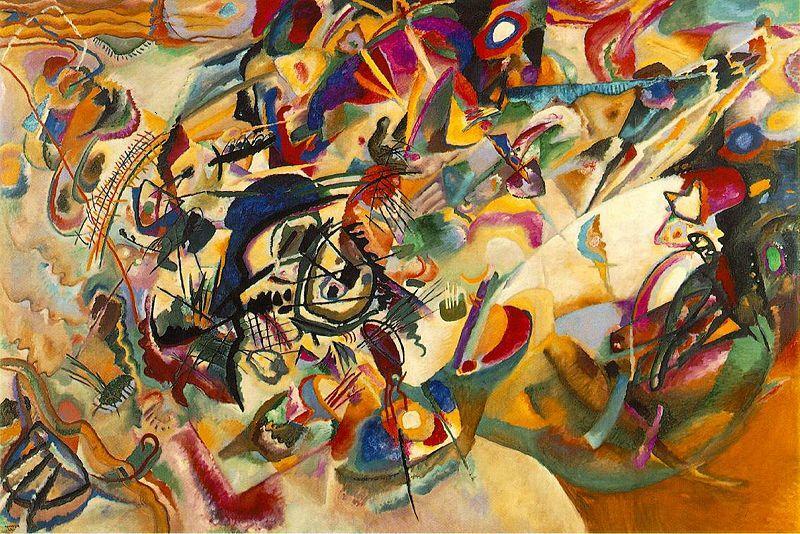 Kandinsky had Synaesthete, which is a neurological fluke a person associates certain colors with notes or sounds. Meaning, that Composition IV (to Kandinsky only) would have had a tune to go with it. In 1916, he broke his engagement with Gabrielle. She moved back to Munich, while he stayed in Russia. He married Nina Andreevskaya, the daughter of a Russian General in 1917. Six years later, he and Nina moved to Germany. He did not agree with the art theories circulating in Russia. He took on a teaching position at The Bauhaus School of Art and Architecture. During his tenure, he painted On White II in 1923, which is a cross in styles between Suprematism and abstract. Everything about it appears very precise. Kandinsky also wrote and published a book, Point and Line to Plane in 1926, it was meant to help explain his theory of art. The school was soon put on the Degenerate Art list by Hitler, and it was shut down, but Kandinsky kept painting. From 1926-1933, he painted 159 oil paintings and 300 water colors, but most of them were lost to the Nazis who confiscated them. They still have not been found. Even though Wassily had become a German citizen in 1928, he moved to Neuilly-Sur-Seine near Nice in France in 1933 with his wife. They lived there until they died. The only communication they had was with their friends, one of whom was Joan Miro. In 1939, he became a French citizen. Wassily Kandinsky died on December 13, 1944. I NO RIGHT AND A GOOD ARTIST!!! this realy helped me with my spanish homework. this article ROCKS!!!!!!!!!!!!!!!!!!!!! HELPED ME WITH my reaserch paper.but got any beta pics? Really Helpful, Thanks so much!